1. Heat oil in a kadai or pan, Fry onion until it turns transparent. 2. Add chopped all veggies like green chillies, capsicum, carrots, tomato, cabbage and saute them till cooked but still have a bite left. 3. Now add turmeric powder, salt to taste and by adding a curry powder from the Maggi noodle. After few minutes, Add tomato sauce, water and mix well. 4. 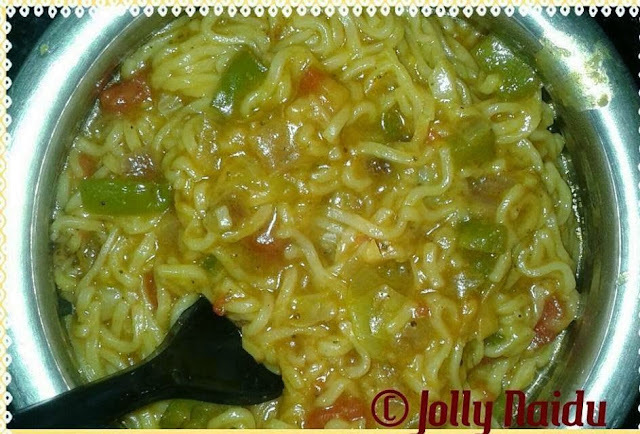 Break the Maggi noodle cake into two parts and mix into the fried veggies and keep stirring for 2 mins. 5. Cover the kadai/ pan, after few seconds, add coriander chutney into the noodles, mix well and let the noodles cook for 6-8 mins. 6. Remove cover and stir for few minutes. Remove from flame.